Antiarrhythmic agents can also be proarrhythmic, which may lead to an increased requirement for ICD therapies. Predisposing factors to proarrhythmias are: (1) electrolyte imbalances such as hypomagnesemia or hypokalemia, (2) underlying ventricular arrhythmias, (3) ischemic heart disease, and (4) poor left ventricular function. One of the most dangerous forms of proarrhythmia is considered torsade de pointes or "twisting of the points." Specifically, torsade is a rapid form of polymorphic ventricular tachycardia associated with delayed ventricular re-polarization. It should be noted that both inherited conditions such as long QT syndrome and the exposure to type Ia and III antiarrhythmic drugs that prolong the refractory period on the cardiac action potential put patients at an increased risk of developing torsade de pointes. Fig. 31. The anatomical regions commonly spanned by transvenous endocardial pacing leads. 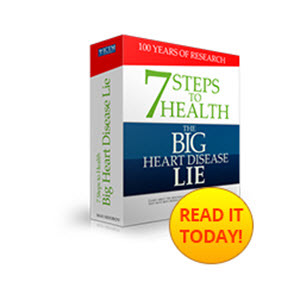 This section focuses on some clinical trials that assessed the value of ICD therapy. Clinical trials serve the important role of assessing therapeutic safety and efficacy for: (1) establishing the validity of current clinical indications, (2) determining new indications for use, or (3) driving reimbursement through identification of clinical value. Properly run clinical studies continue to play an important role in continuous improvement of patient outcomes. Yet, an important distinction to make here is that there are major differences between primary and secondary studies. Specifically, primary studies seek to find morbidity and mortality benefit in those patients who have not experienced an event. These studies identify a patient population considered "at risk" and attempt to identify means to treat such patients before they experience an event such as myocardial infarction or sudden cardiac arrest. In contrast, secondary studies evaluate posttreatment morbidity and mortality benefits to patient populations who have already suffered from an event (e.g., patients postmyocardial infarction or patients who have survived sudden cardiac arrest). An example of an important clinical trial associated with the identification of the indications for ICD therapy is the Multicenter Automatic Defibrillator Implantation Trial (MADIT). This trial was instrumental in providing clinical evidence for identifying the patients who would benefit from an ICD therapy. The clinical hypothesis stated "in patients with previous myocardial infarction and left ventricular dysfunction, prophylactic therapy with an ICD improves survival versus treatment with conventional medical therapy" (40). The primary end point of the study was a reduction in total mortality, and the secondary end points evaluated mortality associated with arrhythmias as well as cost-effectiveness. There were 196 patients included in the study; there were 39 deaths in the conventional therapy arm and 15 deaths in the ICD arm. The stated conclusions were that, in postmyocardial infarction patients at a high risk for ventricular tachycardia, prophylactic therapy with an ICD reduced over all mortality by 54% and arrhythmic mortality by 75% when compared with conventional therapy. A follow-up to MADIT was the Multicenter Automatic Defibrillator Implantation Trial II (MADIT-II). The purpose of this study was to investigate the effects of prophylactic implantation of an ICD on the survival of patients postinfarction who presented with significant left ventricular dysfunction (left ventricular ejection fraction <30%). The primary conclusion of this study was that prophylactic implantation of an ICD in such patients resulted in improved survival and decreased mortality by 28% after 3 years. Importantly, the noted benefits of this study have changed practice in that physicians are now routinely implanting an ICD in postmyocardial infarction patients with left ventricular dysfunction (41). One last study that needs to be mentioned is the Sudden Cardiac Death in Heart Failure Trial (SCD-HeFT). This study set out to determine if amiodarone or a shock-only ICD reduces all-cause mortality compared to placebo in patients with either ischemic or nonischemic New York Heart Association (NYHA) Class II and III congestive heart failure (CHF) and an injection fraction of equal to or less than 35%. 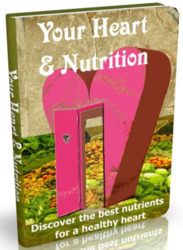 A total of 2521 patients studied at 148 centers in the United States, Canada, and New Zealand. Patients had a minimum follow-up of two and a half years. Results of this study showed that ICDs decreased mortality by 23% and that amiodarone, when used as a primary preventative agent, did not improve survival (42). Cardiac pacing and defibrillation leads are the electrical conduit between the IPG or ICD and the heart. Specifically, they transmit therapeutic energies to the cardiac tissue and return sensed information to the IPG or ICD for diagnostic and monitoring purposes. It is noteworthy that such leads must: (1) withstand an extremely harsh environment, (2) permanently span multiple anatomical and physiological environments (Fig. 31), and (3) undergo approx 400 million heartbeat-induced deformations over each 10-year period within the heart (see fluoro.avi on the Companion CD). Fig. 32. 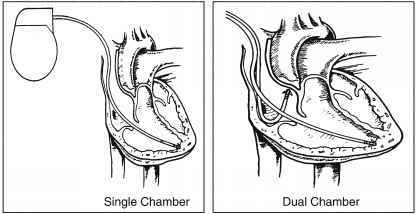 Examples of single- and dual-chamber endocardial lead configurations. Fig. 33. Implanted configurations for two endocardial defibrillation systems with pectoral implantable cardioverter-defibrillator (ICD) placements. The single-coil system (left) delivers the shock energy from the right ventricular coil to the ICD. The dual-coil system (right) can deliver the energy from the right ventricular coil to a superior vena cava coil and/or the ICD. (See energyVectorDual.mpg on the Companion CD.) RV, right ventricle; SVC, superior vena cava. In contrast, epicardial leads are attached directly to the surface of the heart and are routed through subcutaneous tissue to the ICD or IPG. Epicardial leads are most commonly used in pediatric patients and in adults with compromised venous access to the heart. Typical implanted configurations for endocardial single-and dual-chamber pacing systems are shown in Fig. 32, endocardial defibrillation systems in Fig. 33, and an epicardial defibrillation system with epicardial pacing leads in Fig. 34. Modern leads are generally constructed of highly biostable and biocompatible polymers and metals. Configurations for the body of the leads (i.e., the portion traveling from the IPG or ICD to the distal electrodes) are chosen based on the number of circuits required, as well as considerations relating to size, handling, and manufacturer preferences (Fig. 35). The electrodes for stimulation and sensing are designed to provide stable electrical performance acutely and chronically. To provide stability at the cardiac tissue interface, leads often use a mechanism for fixation to cardiac tissue and structures. 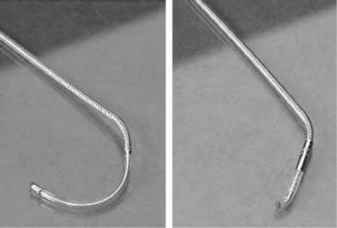 Passive mechanisms for fixation include polymeric tines designed to entangle in the cardiac trabeculae and shaped segments along the length of the lead. They are termed passive because they do not require active deployment by the clinician. Common active means of fixation include helices and hooks or barbs. In addition, some epicardial leads require sutures to maintain a stable position. Finally, some leads have no fixation means whatsoever and count solely on lead stiffness to maintain locational stability (Figs. 36-39). Fig. 34. 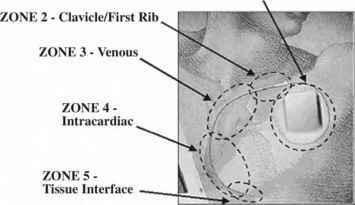 Implanted configuration of an epicardial defibrillation system with an abdominal implantable cardioverter-defibrillator (ICD) placement. The system shown includes two unipolar epicardial pacing leads for pacing and sensing as well as a pair of epicardial defibrillation patches. Fig. 35. Typical constructions used for cardiac pacing and defibrillation leads. Left, the single lumen design has a central conductor surrounded by a polymeric insulation; center, the multilumen design uses an extruded polymer to insulate the conductors from one another and from the implanted environment; and right, the coaxial design has conductors embedded within concentric layers of insulation. Today, the most commonly used insulation materials are silicones and polyurethanes, and the conductors are usually coiled or cabled wires. Modern lead body diameters range from approx 4-10 French (1 French = one-third millimeter). Fig. 36. Endocardial pacing leads: left and right, passive fixation Fig. 37. 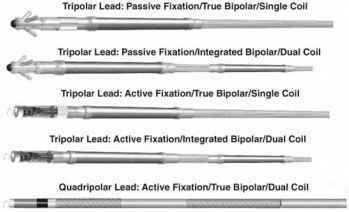 Epicardial pacing leads: top, stab-in active fixation lead; leads (tined); center, an active fixation lead (extendable, retractable middle, active fixation lead with helical fixation; and bottom, a hemi-helix). spherical electrode secured by sutures. Fig. 38. Pacing leads designed for placement in the cardiac veins; they are shaped to enhance stability. The leads shown are primarily used in biventricular pacing systems for the management of patients with heart failure with the appropriate clinical indications. Fig. 39. Cardiac defibrillation leads. Clockwise from upper left: a passive fixation endocardial lead ("integrated bipolar"), an active fixation endocardial lead ("true bipolar"), an endocardial lead with no fixation, and subcutaneous patch. SQ, subcutaneous electrode. For examples of pacing leads placed within the Visible Heart® preparation, see the following movie clips on the Companion CD: 5076huma.mpg (active fixation pacing lead in human right atrium), AApendFL.mpg (active fixation pacing lead in swine right atrium with simultaneous fluoroscopy), rva4074.mpg (tined passive fixation lead in swine right ventricle), 5076humv. mpg (active fixation pacing lead in human right ventricle), and RV Apex.mpg (tined passive fixation defibrillation lead in human right ventricle). 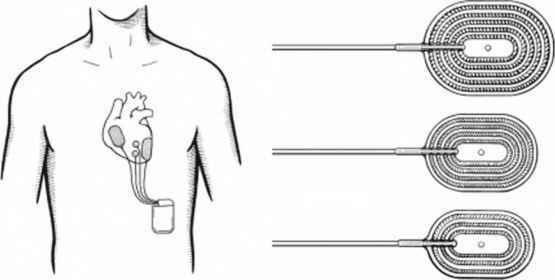 lation electrode only), or they may have a combination of defibrillation electrodes and pacing electrodes. The most common defibrillation lead configurations used today are shown in Figs. 39-40. For examples of defibrillation leads placed within the Visible Heart® preparation, see the following movie clips on the Companion CD: 6944DEF1.mpg (defibrillation lead in the right ventricle of a swine heart; ventricular fibrillation is induced with a shock on the T wave and then converted to sinus rhythm with a high-energy shock) and 6932humf.mpg (defibrillation lead in the right ventricle of a human heart; ventricular fibrillation is converted to sinus rhythm with a high-energy shock). Fig. 40. Endocardial defibrillation leads. Various configurations are shown, including leads with active- and passive-fixation mechanisms, true and integrated bipolar pace/sense circuits, and single- and dual-defibrillation electrodes. The designs shown are typically placed in the right ventricle, with the distal defibrillation coil within the right ventricular chamber and the proximal coil located in the superior vena cava. Fig. 41. Common electrode coatings for high capacitance and low polarization. (A) A platinized surface at x20,000; (B) a titanium nitride (TiN) surface at x20,000. Fig. 42. Evolution of pacing lead impedances and pacing thresholds. From ref. 42. Coatings are also applied to many pacing electrodes to increase the cathode-tissue impedance and increase system produce a large surface area that is highly capacitive (to efficiencies by reducing current drain (Figs. 42 and 43) (43).